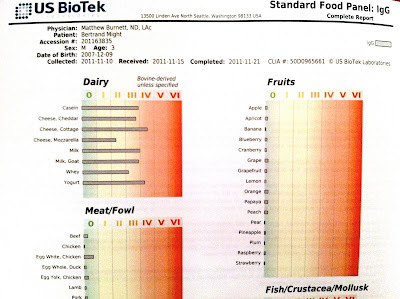 At Bertrand's follow-up with the naturopathic doctor today, we received the results for his IgG food sensitivity panel. 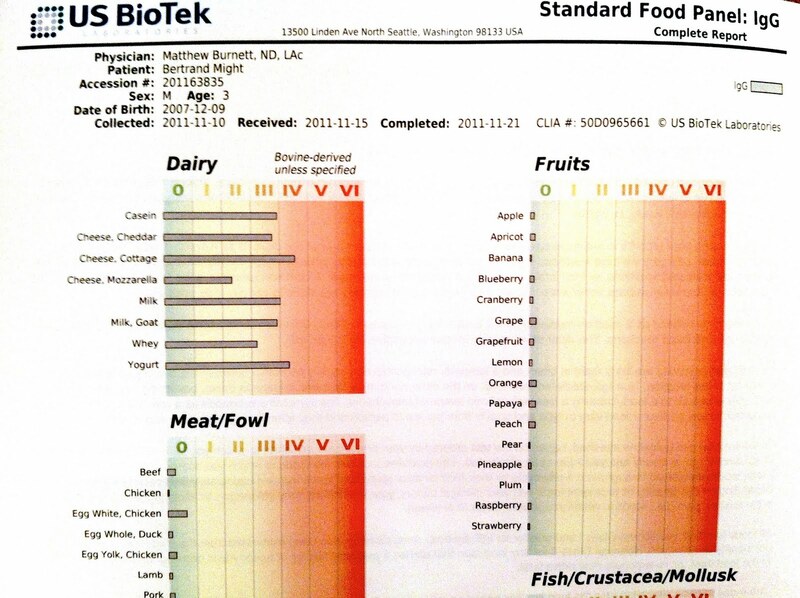 According to this test he is highly reactive to most dairy... AND soy. (Oops! So much for soy milk.) 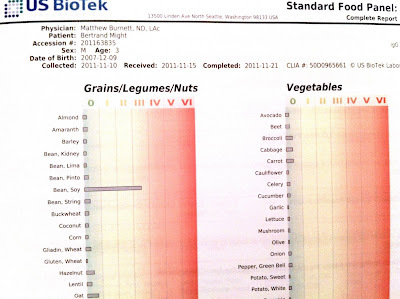 We'll seek a consultation with an allergist. 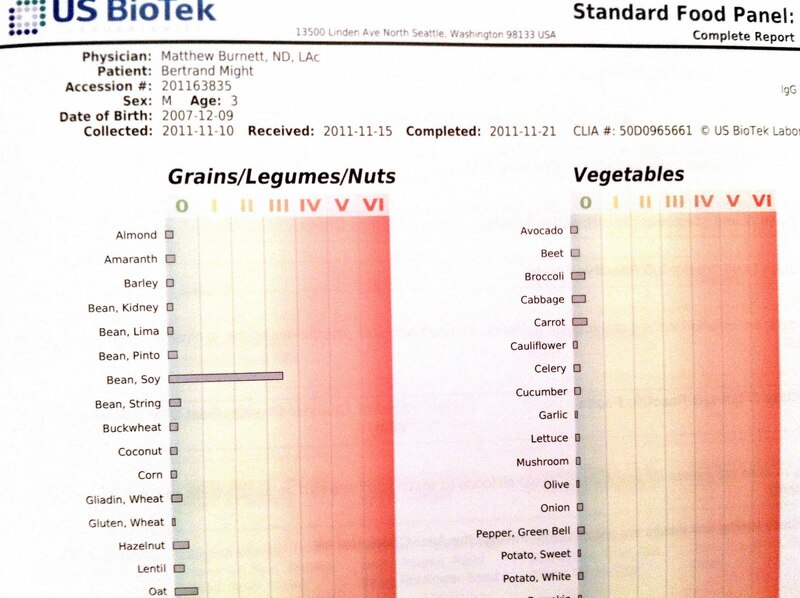 In the meantime, we'll continue to experiment with a non-dairy/non-soy regimen for Bertrand. Good thing he loves coconut milk. Carrageenan is insidious too - for example, companies like to put it in "ice cream" so they can use more skim milk and less "cream". Millions avoid soy because of the estrogens, few people realize that they're allergic to carrageenan. I myself thought it was safe until earlier this year. Just stumbled across your blog. What an adorable family you have! I recognize your neighborhood (hope that isn’t too creepy!) and we’re practically neighbors – we’re in the lower Aves. My youngest daughter, Naomi has been diagnosed with a neurotransmitter disorder, so we also spend a lot of time up at Primary’s. 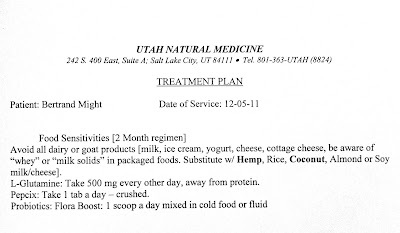 I’ve been thinking about checking out Utah Natural Medicine, but have hesitated since I don’t know anyone that has gone there and it seems pretty expensive. I’d love to hear what you thought about it and if you think it was worthwhile. Also, I have to give a shout out for hemp milk. I’ve been making my own (hemp seeds, water, coconut oil, and agave syrup in a high speed blender) and it’s pretty tasty, high in protein and iron, and has the perfect omega 3:6 ratio. Just a thought :-). 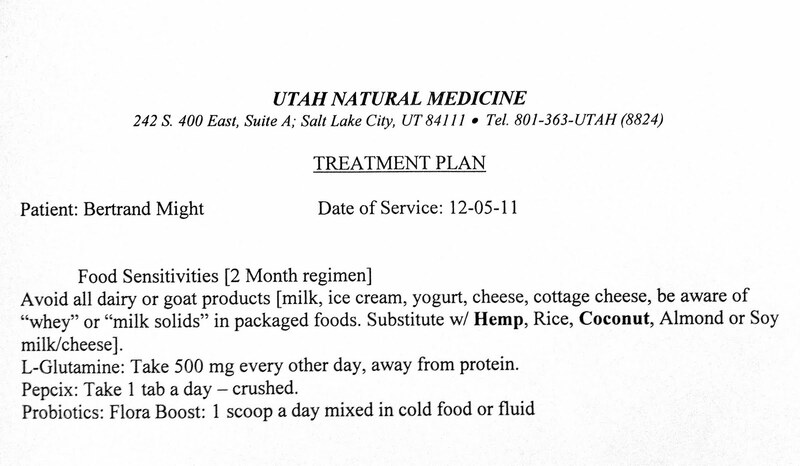 And, Jen, so far we've really enjoyed our interactions and results with Utah Natural Medicine. We hope to be able to recommend them in the next few months or so. We're still at the very beginning of our relationship there, it *is* very expensive, and I don't make recommendations lightly. :) Best of luck!